I call this the Dancing Christmas Tree because that is what my friend Carmen said it looked like. I made 18 of these cards and I am lucky I got that many done. I was just really stuck this year on what to do for Christmas cards. They aren't elaborate but they will have to do! I really love this tree! I thought it was going to be a pain to cut with all the little intricate designs in the middle but it cut wonderfully. When I received the Paper Trimmings cartridge I knew I wanted to use something from it for my Christmas cards. This cartridge was the latest the Cricut Circle members received as part of the membership. 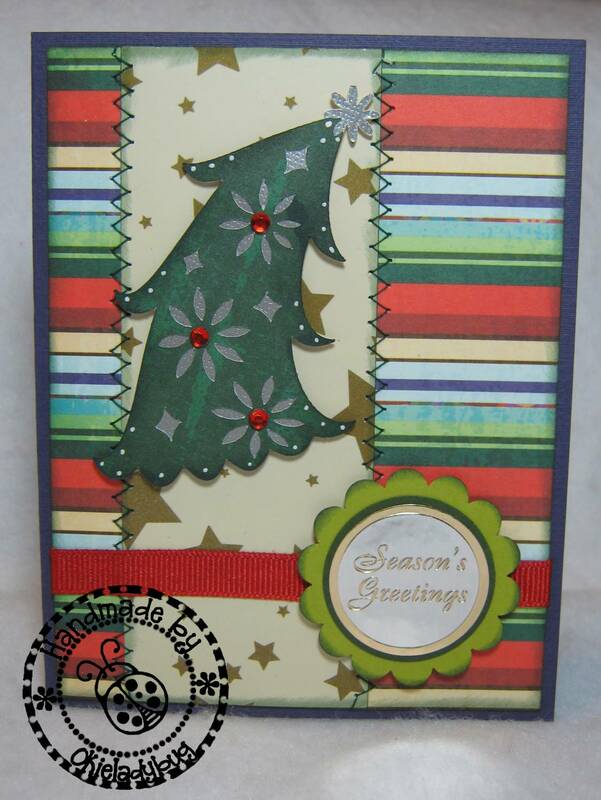 Adding the hot fix gems and the white dots really made the tree stand out on the card. I did ink the edges of the tree with a dark green but you can't really tell in the picture. 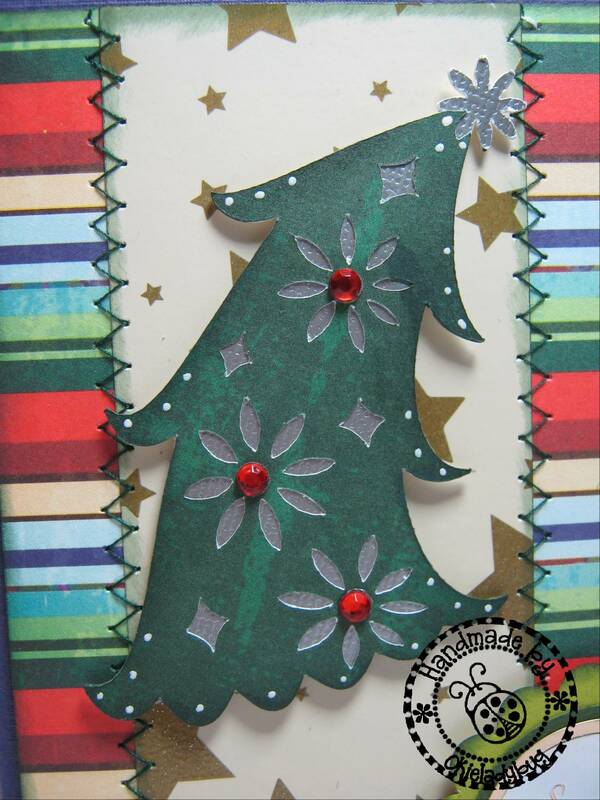 The tree is cut from the back of the striped paper, I really love double sided paper sometimes!! 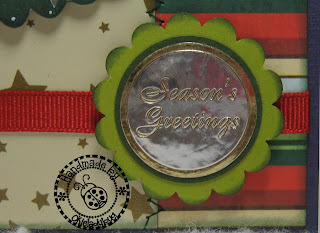 The "Seasons Greetings" is an embossed seal sticker I got from Staples several years ago. I think I paid about a quarter a package for them. I hadn't used them until now and I thought they made a great sentiment for the front of this card. I think it probably measures about 1 1/4"since I used the 1 3/8" circle punch on some dark green cardstock to help border the embossed seal. Like I said, these cards aren't as elaborate or cute as I have done in the past but for this year...they will just have to do! Linda is coming tomorrow to have me help her alter a frame and work on some dry erase boards that she is wanting to give as gifts. I am sure that will be causing a trip to the scrapbook store, darn the luck! HA HA HA Later today I plan on working on some of the Ghiradelli boxes. I want to give those to my poker dealers as a little gift. I will be taking pictures of those to post. Maybe not elaborate, but I personally love the simplicity of this card. This is a case of "less is more!" Love this card! It just looks so happy! Happy Holidays to you and yours. Big Hugs!!! Shrinky Dink Wine Charms - with Video!